In this article, we’ll create a Clojure web app talking to a Postgres database. You should know, that I’m by no means an expert on the subject - this is just front-end developer exploring new areas. Big thanks to my friend Chris Wolfe who helped me understand a lot of concepts presented in this article (and was extremely patient at that). 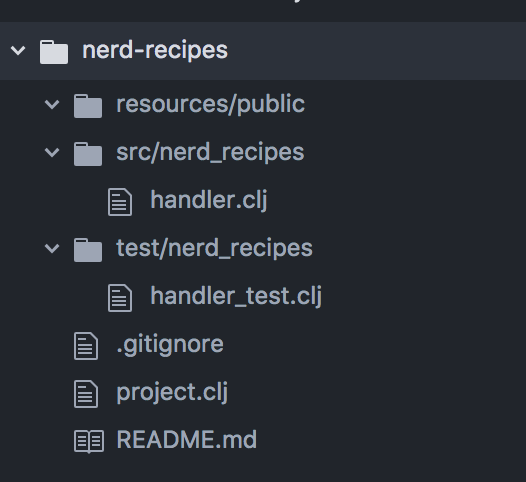 We’ll build a simple app for storing cooking recipes called NerdRecipes. I’ll continue working on the same concept app in future articles. You can find the final code for this part here: https://github.com/smogg/nerd-fitness. The app will be based on the simple Compojure template. The app will be talking to a Postgres database and it will have a few endpoints to save/fetch the recipes. It will be fully tested. In the future we will build authentication/authorization for our endpoints as well as the UI. The latter part most likely will be done in Reagent (with re-frame). As mentioned earlier, we’ll use Postgres for our project. I won’t go into too much detail about setting up a database since a simple web search will reveal everything you need to know. I’m using Postgres app for Mac. As you can see, we’ve set up our connection to look for a database named nerd_recipes. Let’s save above commands under dev/init_dev_db.sql for future use. You (or anyeone else) will be able to run the file using psql -U postgres -f dev/inti_dev_db.sql from the command line. If everything went well you should see similar responses. We required java.jdbc and the connection pool we’ve set up previously in nerd-recipes.db. Then we used java.jdbc to create the test table, add an entry in the same table and then we verified that everything actually got saved to the database. Last but not least, we removed the same table and left the database as we’ve found it. Running jdbc/db-do-commands with SQL strings in Clojure all the time is not pretty nor fun. Hugsql to the rescue - it will let you write plain SQL (with some additional helpers) and then automagically import those statements into your Clojure code (for example by defining functions in current namespace). It’s a great library with even better documentation that separates concerns you want separated. Add [com.layerware/hugsql "0.4.8"] in your project.clj dependencies and create a new file under src/nerd_recipes/db/sql/recipes.sql. Next, add a few simple SQL statements for creating the recipes table, where we will store our app’s recipes. We are also creating a few handy statements we’ll use to create new or select recipes. Hugsql is gonna use the part after -- :name ... to define Clojure functions under the corresponding name. The :? or :! part tells hugsql what kind of result is expected. For recipes-with-cols we used :* on the :name line, and :i:cols later, in the sql statement. This is literally expanding a Clojure collection (items will be separated by commas) inside your SQL. Neat! Refer to Hugsql docs to learn more about what just happened. Notice we no longer need java.jdbc to run the commands. You can remove it from your project’s dependencies as we’ll no longer be using it in this project. This way you won’t have to think about database logic at all when creating/getting recipes elsewhere in your app. Next, let’s set up database migrations. We’ll use Drift - a simple, file-based migration library for Clojure similar to Rails. Add [drift "1.5.2"] in your :plugins and :dependencies sections inside project.clj. You’ll notice we also added two new keys to Drift settings - :init and :migration-number-generator. First one makes sure that schema_migrations table is present before we start migrating our database. The second one tells Drift which function to use when coming up with a new database version number. We used Drift’s built-in incremental-migration-number-generator which basically bumps the current version number by one. INFO: No changes were made to the database. $ psql nerd_recipes -U admin -c "select * from schema_migrations"
Run lein test from the command line and make sure everything passes. Next time we’ll actually create a few Compojure routes and add an authentication system.